Our latest exciting news is that we are planning a choir for Palm Sunday to sing Mozart’s Ave Verum Corpus. Rehearsals will start on 5th March. See the bottom of this email for details. As many of you will know, we have had a problem with some of the chairs at church. We need to replace them urgently. We will have examples of possible chairs and prices on Sunday so that everyone can contribute to the discussion. This Sunday our readings are Genesis 17:1-7, 15-16, Romans 4:13-25, and Mark 8:31-38, and we will be singing the hymns The God of Abraham Praise, All for Jesus, O Breath of Life, and Christ is made the Sure Foundation. You can find the readings via this link. Our sermon will be reflecting on Jesus’ call to trust him with our lives. Many people in church this morning expressed an interest in singing for Palm Sunday instead of Easter as some will be gone by then. ALL ARE WELCOME TO COME AND SING! **Copy paste this number: 18.799589, 99.005317 into the google and google maps will come up with the rehearsal location, Chiang Mai International school. Your name, Part you sing, and which of these rehearsals you can attend ( I’ll need this to help the guards at CMIS let you in to the school). Ash Wednesday at All Saints! 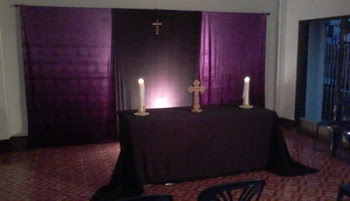 We had a very moving and thought-provoking Ash Wednesday service yesterday. A time to reflect as we enter this season of Lent. Our lenten thoughts will continue this Sunday when our readings will be Genesis 9:8-17, 1 Peter 3:18-22, and Mark 1:9-15, and we will be singing the hymns Awake me Soul, O Love that will not let me go, Dear Lord and Father of mankind, and Joyful Joyful we adore Thee. 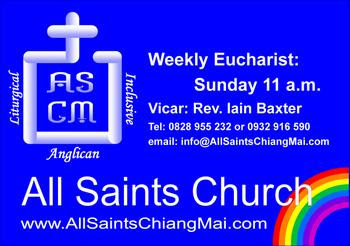 You can find the readings via this link. Our sermon will look at God’s promise marked by the rainbow. Meanwhile, this Friday, the Chiang Mai LGBT Group will be using our building to show the highly acclaimed 2014 movie Pride, on Friday 27th February at 7pm. This is a popular British film set in the Miners’ Strike of the early 1980s. A group of activists travel to a small South Wales village to offer their help. It is a funny and thought-provoking film which had a 15 certificate when first released. You will be asked for a THB100 donation which includes one free drink and snacks. Everyone is welcome to attend, you do not have to be a group member. Pancake Tossing & Organ Building! It does not seem a minute since we were wishing each other “Happy New Year”, but Lent is almost upon us and this Sunday we celebrate the Feast of the Transfiguration. We will also have a pancake-potluck in anticipation of Shrove Tuesday. In England, this is marked by eating pancakes, tossing pancakes, and competitions such as pancake races, where competitors run round a course while tossing a pancake! This Sunday, we will provide the pancakes and you can bring your choice of toppings to share! 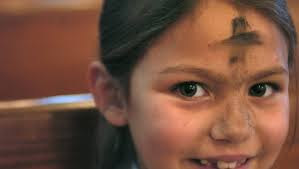 Then on Ash Wednesday we will have a special service to mark the beginning of Lent. This will be on 18th February, beginning at 7pm. The liturgy will include the imposition of ashes as we come before God in repentance and thanksgiving. Further ahead comes Easter. And we would like our Easter music to include the inauguration of our new organ! Over the last few weeks, Harvey and I have been experimenting with building a church organ using the Hauptwerk computer software. It will allow us to play a replica of the organ of St. Anne’s, Moseley, in England. This week the Salomonssons had a go on our prototype, one playing the manuals, and the other the pedals via a third keyboard! 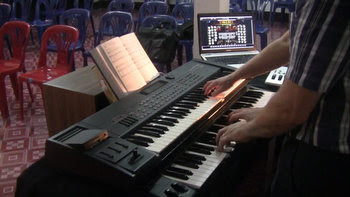 To build the basic organ will cost us about THB30,000, including about THB23,000 to buy a computer to run the software. This will include a touch screen to control the organ stops. 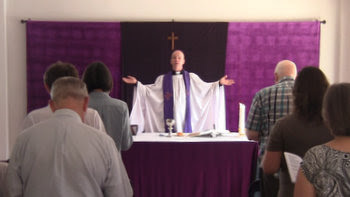 However, the computer will also do double service for the church office. Two handed – the Great and the Swell manuals! The remainder of the money will be used to build the organ box, and later the foot pedals! You can hear our test with Praise ye The Lord here! 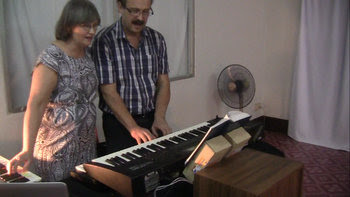 We are opening a special “organ fund” for anyone who would like to give towards this project. We also need organists! We should hopefully have three or four people who would be happy to play at least once a month. Meanwhile, this Sunday our readings for the Feast of the Transfiguration are 2 Kings 2:1-12, 2 Corinthians 4:3-6, and Mark 9:2-9, and we will be singing the hymns All People that on Earth do Dwell, Transfiguration Hymn, Break Thou the Bread of Life, and Love Divine all Loves Excelling. You can find the readings via this link. Our sermon will be entitled Amazing Jesus! 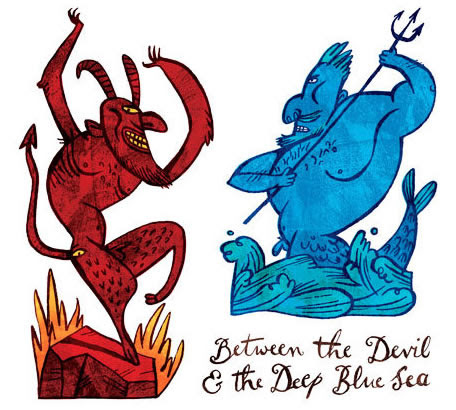 In Chiang Mai we are a long way from the deep blue sea, but what about the Devil? Our current series of Gospel readings repeatable talk of Jesus “casting out demons.” How can we understand this, and what does it mean for us today? I will be attempting to answer these questions in my sermon this week! Meanwhile, we have a new blue sign outside All Saints. Now any one who is passing will know who we are, how to contact us, and when we worship. There is a rainbow in the bottom corner to remind us that all are welcome!